Dual lane water slide with a giant pool at the end. This water slide has two lanes with water going down each slide into the pool to make your experience unforgettable. Great for any ages, including adults. 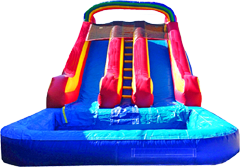 This Water Slide can be delivered at any of these surrounding areas tampa, bounce house rentals in Tampa, west tampa, new tampa, lutz, wesley chapel, riverview, bounce house Brandon FL and ALL of Hillsborough county.